Oddly, I applied that term specifically to him earlier in the week immediately after asking myself, "Who is the world's biggest individual polluter?" After thinking about what should be done to limit continuing damage he will cause as an ex-President, this last debacle elicits the right solution. It's so simple, it's so obvious--for the good of America, as a gift and courtesy to humanity, cutting out his tongue is an absolute necessity. 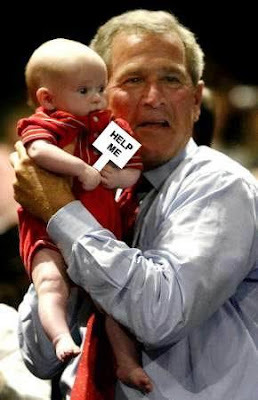 Bush has a child's intellect. He will never grow mentally further than that of a toddler. A stunted intellect, without a single redeeming or engaging quality that a child might possess. But definitely oodles of the meanness. He had to work on the charm; the meanness he was born with. "It's so simple, it's so obvious--for the good of America, as a gift and courtesy to humanity, cutting out his tongue is an absolute necessity." That is the best punishment for Bush I've ever heard.